Interested in a job where you can learn valuable leadership skills? Try officiating. Attend our information session to be considered for hire. 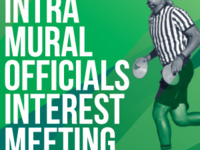 Outstanding candidates will be chosen from attendees to officiate intramural sports for pay. The Intramural Sports program hires over 60 student officials every semester. In the fall semester, student officials are hired for volleyball and flag football. In the spring semester, student officials are hired for basketball, soccer, and softball. The best officials for flag football and basketball are chosen to officiate at Regional Extramural tournaments with a chance of being picked to officiate at National Championships.